As the Head of Design & Discovery (D&D) within the Library IT division, Rachel oversees a team of user experience and accessibility specialists, web designers, front-end web developers, and program managers. Beyond the library, she's a member of the NISO's Flexible API STandard for E-content NISO (FASTEN) Working Group, on the Board of Directors for ALA's Games and Gaming Round Table, on an advisory committee for the Designing for Digital conference, and is an editorial board member for Web Management & Marketing: The Peer-Reviewed Journal. 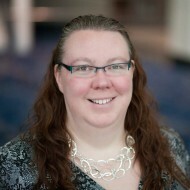 Previously, Rachel was the 2014 President of the Library & Information Technology Association (LITA), a 2014 Library Journal Mover & Shaker, and a 2007 American Library Association (ALA) Emerging Leader. She was also invited to participate on the Horizon Project Academic & Research Library Panel of Experts for 2016-2017, a group that selects the topics and informs the production of the New Media Consortium (NMC) Horizon Report: 2017 Library Edition. Her research and professional interests include user experience, information architecture, open source technologies, digital libraries, discovery technologies, service design, and library leadership. She's also an avid board gamer. Rachel is originally from southwest Ohio and earned her Bachelor of Arts in English from the University of Dayton and her Masters in Library and Information Science from the University of Pittsburgh. Rachel joined the U-M Library in August 2016. She has previously worked at the University of Houston in Houston, TX, Vanderbilt University in Nashville, TN, and Miami University in Oxford, OH.